Casa Havana | Eat It, Damn It! I worked in Chelsea for a few years back in the mid 90’s. There was always an excellent number of restaurants to eat at within a four or five block radius. Everything from chic to dive was available. However, the turnover was ridiculous. Especially on Eighth Avenue. 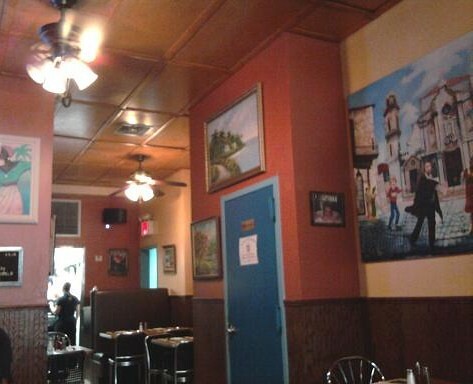 A block away from the Joyce Theatre sits Casa Havana. I first took notice of the restaurant a year ago when I was handed a flyer before walking into a performance. “We’ll see how long this place will last,” I thought. Either it was converted from or was designed specifically like a coffee shop. When you first enter the door, you have to squeeze past the counter and swivel stools. There is a grill and preparation area just like you would find at any breakfast nook. This is not altogether inappropriate since Casa Havana served the three squares of the day. Venture further and it opens into a dining area with another kitchen in the back. My girlfriend and I started with the Papa Rellena ($2.50). 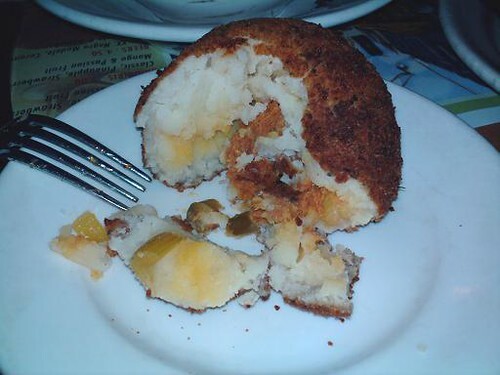 It’s a fist-sized, deep-fried, mashed potato ball filled with shredded beef. The menu described it as ground beef, but this was more strips than minced bits. The beef inside is tender, but not exactly bursting with flavor. Nice, but thinking back on it, a spritz of the hot sauce that was on the table might have made things more exciting. She commented that it could have been hotter, temperature wise, as it was pretty tepid once it reached our table. I commented that I was not sure how hot they could make mashed potato without drying it out. Anyone care to comment? Plantain lovers will really enjoy this place as they have both Maduros and Tostones. 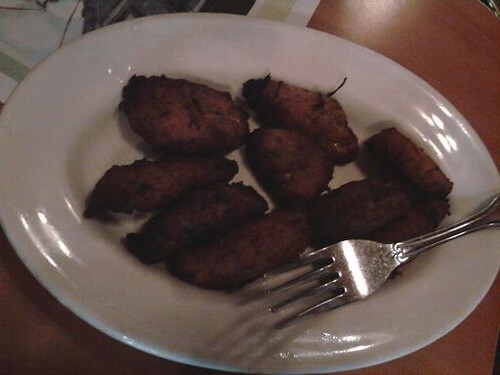 We opted for my personal favorite: Maduros ($3.00). Almost impossible to mess up, they were properly fried and delicious. Though they have the obligatory selection of soft drinks, I highly recommend trying one of the milkshakes, AKA: Batidos ($3.50). 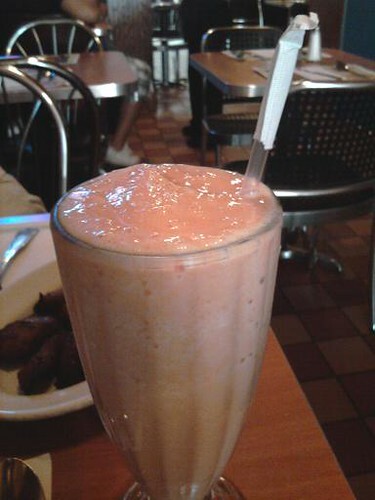 The decidedly tropical flavors are Guanabana, Mamey, Mango, Passion fruit, and Papaya. I went for the Papaya which was wonderful. The Ensalada De Pulpo, octopus salad (small $6.50), was more slaw than salad. It was a collection of celery, peppers, olives and plenty of octopus. While very tasty, the dish is awash in oil, much like the kind you get with a can of tuna. I’m no octopus salad expert, but have had it a few times before. I was hoping for some bits of tentacle, some meaty chunks from the deep, something tactile to caress my tongue. This dish did not skimp on the meat, but I think it was the meat of the babies, small, smooth, and circular. Though tender, it didn’t have the same heft of the tentacle pieces I’ve enjoyed in the past. Is this particular to Cuban cuisine? Was I finally having it the right way after enjoying the wrong way in the past? 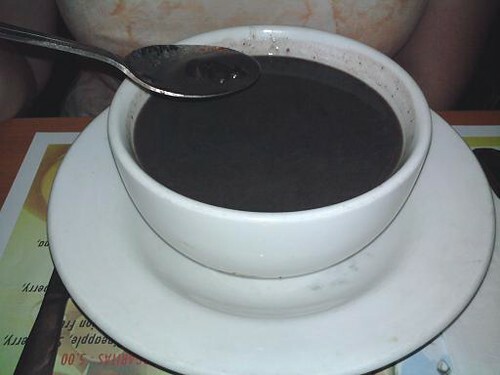 The Black Bean Soup (large $6.75) should be called the cauldron. The large is huge! The soup is pure black bean goodness. Some people might consider the dish under-seasoned as the flavor of the bean is tantamount. There are no added accouterments, such as onion or tomato, and it is clearly not an artisan dish. If you are just looking for a plain black bean soup, this is the ticket. My girlfriend was overjoyed. 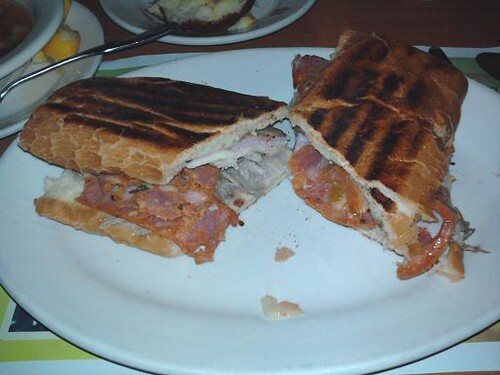 I was totally enamored with the Cubano Especial ($6.50). The regular Cuban features roast pork, ham, Swiss cheese, pickles, mayo and mustard. The Especial adds chorizo. If you’ve never had chorizo, think of it as Latin pepperoni. Everything is pressed together inside a sort of club roll. EXCELLENT! The sandwich was bursting with flavor, but no one element dominated my taste buds. Everything blended together in a magical cacophony. It didn’t taste especially salty, sweet, sour, or swiney. I cannot recommend this enough. 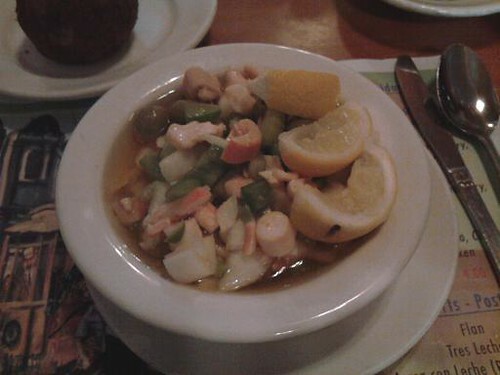 If you make the trip to Casa Havana, you must have this dish. I noticed a special on one of the walls: ice bucket of five beers for $7.00. Hell Yeah! They may be the mini bottles, but still.. The place is air conditioned, the food is delicious (and reasonably priced), and you can share a bucket of beer with friends. This is the perfect spot to get off the street during the high heat and humidity of midday. However, even if you don’t partake of the beer special, definitely make a trip to Casa Havana. Hopefully, this will be a restaurant that sticks around for awhile.